The most rapid change in the societal and economic system ever experienced and the additional burden based on the current economic crisis, show the need for a new understanding of change management in administration. The system calls for a change of second order. With one of our clients, the VAEB (social insurance) we developed a new model of change management. This is, what we presented for the EPSA 2009 and won a best practice certificate (http://www.epsa2009.eu/). The primary goal of our project was to find a common understanding of the necessity of change and of change in itself. The concept of the “learning organization” to which we stick since a couple of years was the beginning. Nevertheless there was still a lack of a common understanding of change and the case for action. The concept we developed is called “The LILA Management Principle” (which was recently published as a management book by Amathea-Signum, ISBN-13: 978-3854364054). 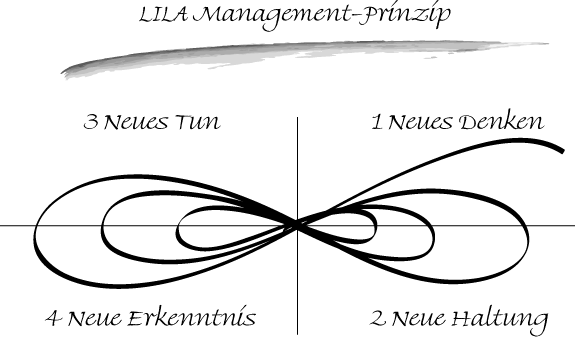 The change management principles of LILA (= Lernen In der Liegenden Acht) are simple but deeply enough not to lose all the complexity. What is new about the concept? Firstly, we used a symbol for change management in order “to get the whole thing at a glance”. We integrated the “infinity symbol“ (∞Lemniscate of Bernoulli) in the sense of life-long learning and change, with the “spiral development” in the sense of “bringing life and viability into change management”. The result was the “Spiral Eight” (in German: Die liegende Spiral-Acht). Secondly, using this symbol of Spiral Eight we were able to define four dimensions (quadrants Q1-Q4) of change management. Q1-MIND: New thinking, Q2-HEART: New attitude, Q3-MOTION: New activities, Q4-PATTERNS: New insights, thus learning. Having defined this new change management process it is possible to develop a common understanding of change in top management teams. And thus, the four dimensions cover the whole complexity of change and are easily to catch and to remember. Thirdly, we then were able to discuss change from a totally new perspective. Having a common picture in mind we could get into a dialog about the content and the process of change. Q1-MIND: We need to rethink our organization, our business model, our vision and mission. Here we made use of management cybernetics and the theory of self-organization in order to move minds quite a bit. What would our organization look like, starting to develop it from cratch? As concrete results we implemented the “Viable System Model (Stafford Beer)” in parts of the VAEB as totally new principle of organization structure, and initiated a “self-organizing, self-reliable maverick team” (we call it BEX Team, having invited 25 young employees, high potentials and already well known mavericks) in order to question the strategy, the organization and the management of the VAEB. Q2-HEART: To enhance the corporate sustainability we need a new attitude of leaders and leading teams and thus of the whole organization with all its employees. The new attitude is based on a new ethics, a set of values, a new understanding of responsibilities (also corporate social responsibility – CSR), a new form of cooperation (also diversity) and hence, a higher social capital (ties*norms*trust). As concrete result we developed in a bottom-up process our new minimum principles of membership, consisting of six values and leading principles. Q3-MOTION: New activities. From our point of view, new thinking and new attitude come into practice of work by new forms of communication and viable dialogs. Liveliness and vitality can pervade the organization starting a dialogue with management and employees in “new rooms of communication”. As a concrete result we implemented a dialog on values and principles inviting all employees and leaders into “World Cafés” (called “Leitbildcafés”) and “all-in-one-room-conferences”, reaching approximately one third of the whole staff of the VAEB. Q4-PATTERNS: New insights, thus learning. How far did it get us? What came into movement? What new patterns can be identified? What shall be amplified in the next “loop along the Spiral Eight”? We are convinced that change is necessary but still, change is too energetic for the change sake. The new patterns must be identified as more appropriate, they must fit into our new thinking in a better way and, last but not least, they must bring effectiveness, joy and sense, for both sides, within the VAEB and for our clients. This is what the new understanding of change management and leadership is all about in the VAEB since we developed our own approach “The LILA Management Principle”. EPSA 2009: European Public Sector Award (http://www.epsa2009.eu/).